Promotional gift boxes are a great way to show your appreciation to important clients or employees. Besides showing some extra consideration to the recipients, gift boxes show off your brand’s personality and creativity. If you’re not sure where to start, we have a few simple tips to inspire you! Consider what promotional products speak to your brand. If your business deals in paper goods, a high quality pen makes more sense as a gift than a stylus or earbuds do. Conversely, if you’re an online or a tech business, a stylus or earbuds make perfect sense! Once you’ve nailed down your brand’s personality, make sure the items that suit your business work together in a gift box. For example, pens, notebooks, planners, or other desk items together create a cohesive message. A gym bag, sports bottle, and towel also follow a similar theme. If you don’t want a strong theme like the office or gym examples, work more loosely with items that have a similar mood. Consider a younger, relaxed vibe by combining sunglasses and earbuds or a bluetooth speaker. When creating a gift box, there’s no reason to go over the top. 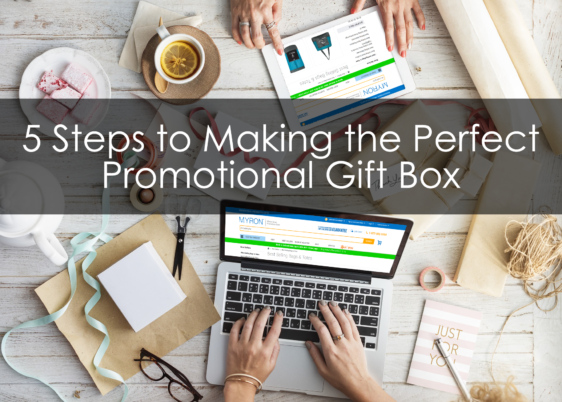 One benefit of a promotional gift box is to create the same effect of giving away an expensive item without actually having to spend a lot of money. Figuring out the right combination of items, whether it’s a whole set of affordable desk items or two higher priced items, is more important than how much you spent on creating the box! While the items in the gift box are imprinted with your brand, you should also consider how to personalize it for the recipient. You might include one item that’s personalized with their name, but an even simpler solution is to include a handwritten card. You’ll be surprised how much a small note will help your brand stand out in memory to anyone who receives this gift box! Keep the packaging in mind! Presentation is half the battle when it comes to making a memorable promotional gift box. Make sure to arrange the items in an appealing fashion, and then consider an attractive box or even a customized gift box. For a 2-in-1 solution, make your “box” a bag! For bigger gifts, pick a duffel or gym bag, and for smaller gifts, choose a tote bag or a reusable shopping bag. You can even use a small cooler if it suits your business’s personality- be creative! For more tips and an expansive catalogue of customizable promotional products, visit Myron. With a 100% satisfaction guarantee, you’ll be able to find the perfect items to make an incredible promotional gift box for your business!